Awesome Beginning: Donny Swords’s Ways of the Stygia- Fallen Song: Author's Cut has one of the best introductory sequences (i.e. 30% of the novel) that I have read in years. The reader is introduced to Donny Swords’s Stygia Series via the character Thomas Van Pelt, who has a strange ax in his possession (the titular Fallen Song). Thomas’ first person narrative unravels an intense mystery beyond imagination; by intense, I mean this is mature dark fantasy (not for the Young Adult crowd) delivered with direct punches and crime scenes that will make veteran horror readers flinch. The beginning chapters deserve a soundtrack (heck, it seems that the written word provides the music); chapters alternate with a heavy metal vibe to eerie orchestral (like the 1971 movie A Clockwork Orange); it reads as if Elric’s infamous demon-possessed sword “Stormbringer” was given to a modern day, vigilante policeman. The book summary accurately summarizes the rest without spoiling (copied below). Holy Epic Battles, Batman! By the time the reader reaches the 30+% mark, s/he will be starving for some portion of the mystery to be revealed; this is delivered over the remaining chapters, in doses that explain as much as they complicate. The first-person narrative subsides and an abstract third-person style dominates; characters upon characters are introduced, titrating one’s mind until brimming with mythical concepts. This is truly epic conflict. Mid-journey, I admit to be being a little frustrated since the story seemed to diverge faster than I could keep up, and the style became less experiential and more journalistic reporting. Closes Nice: That said, the ending was delightful and very satisfying. This was in part to the reemergence of Thomas’s voice, but the plot also closed succinctly (with unexpected twists). On the whole, Ways of the Stygia- Fallen Song: Author's Cut defines Stygia as a compelling temperament/emotion/location/substance (I am being deliberately obtuse, no spoilers here), and will show you the Way to Stygia as promised. More Stygia This review is timely, since an extension of the series should be available in just days (Cult of Morgod releases Sept-19-2014). I recommend this to horror fantasy readers looking for entertaining, epic weirdness. Thomas Van Pelt lived a normal life. On one dreary raining evening that all changed. His work as a CSI investigator had led him to yet another crime scene, and there, prompted by his primal senses he discovered the ancient artifact that would that day forward alter his own life and the fate of the universe itself. The ancient weapon Fallen Song summons Thomas, and reawakens his forgotten past. He embarks on his new calling- bringing justice to the guilty, the ones who would otherwise remain free to perpetrate their vile acts on the unsuspecting. Thomas is reunited with past allies and embarks on an epic adventure involving demons, necromancers, deities, vampires, sorcerers and the terrorists of Purgatory itself, the night stalker. Get pulled away to new lands, terrible enough to cost you sleep and see what ends Thomas will go to in his quest to bring a new era of light to an ailing universe. "Dyscrasia" is a real word; and it is not a fictional land! 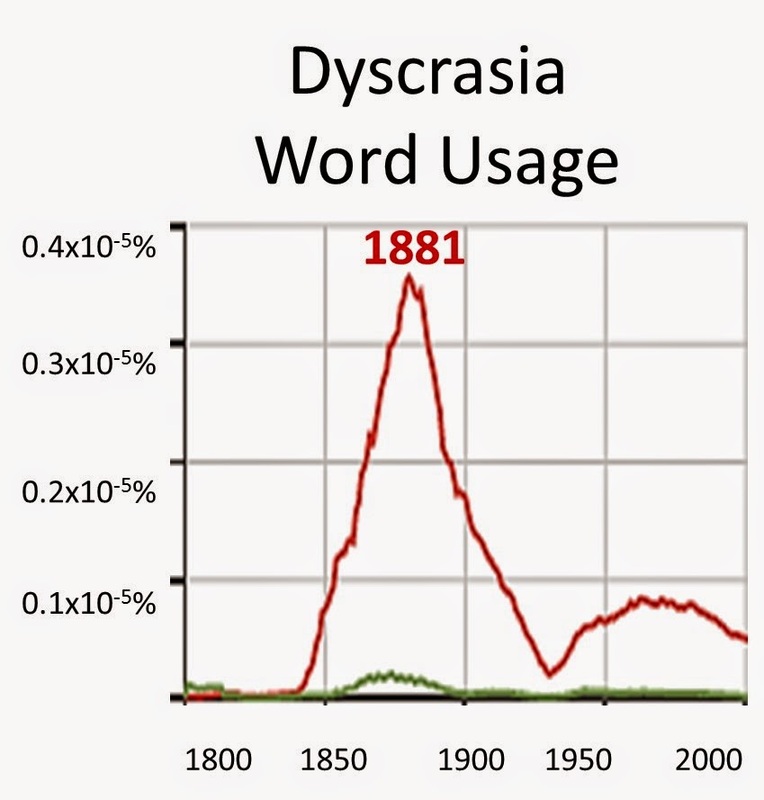 According to Google's Word Viewer NGRAM, it's peak usage was in 1881! So what does it mean? Dyscrasia literally means “a bad mixture of liquids.” Historically, dyscrasia referred to any imbalance of the four medicinal humors professed by the ancient Greeks to sustain life (phlegm, blood, black and yellow bile). On the other hand, eucrasia meant a healthy mix/state. Artisans, anatomists, and chemists of the Renaissance expressed shared interest in the humors; accordingly, the scope of humorism evolved to include aspects of the four alchemical elements (water, air, earth and fire) and psychological temperaments (phlegmatic, sanguine, melancholic and choleric). In short, the humors are mystical media of color, energy, and emotion; Dyscrasia Fiction presents them as spiritual muses for artisans, sources of magical power, and contagions of a deadly disease.